Shuttle astronaut Piers Sellers (left) records heat shield repair tests from his perch on the ISS robotic arm during a July 12, 2006 spacewalk in the Discovery shuttle's payload bay. At right, spacewalker Michael Fossum shades the samples for the infrared camera video session. HOUSTON - Working with space caulk guns anda pair of scrapers, two NASA astronauts put a black, sticky goo through itspaces during a Wednesday spacewalk to test basic shuttle heat shield repairtechniques. SpacewalkersPiersSellers and MichaelFossum spent most of their more than seven-hour excursion in the payloadbay of the space shuttle Discovery, where they evaluated methods of applying anexperimental heat-resistant material onto samples of the same type of panelsthat line the orbiters wing edges and nose cap. The astronautsbegan their spacewalk at 7:13 a.m. EDT (1113 GMT) as Discovery and theInternational Space Station (ISS) passed over Spain, and spent seven hours and 11 minutes working outside their spacecraft. Sellerssaid their primary task - testing a putty-like heat shield repair materialdubbed NOAX - was more akin to a "meticulous lab experiment" rather than theheavy lifting of Monday's spacewalk to repair the space station's MobileTransporter. Thespacewalkers squirted the heat-resistant material onto intentionally damagedsample areas using a caulk gun-like tool and smoothed it out with spatulas. "It bubblesup nice when it comes out," Fossum said. NOAX, whichis short for non-oxide adhesive experimental, is a sticky black substance thatcarries the initial consistency of peanut butter before it is worked into placein orbit, NASA officials said. The space agency described the material as apre-ceramic polymer that is impregnated with carbon silicon carbide powder. Engineersdesigned NOAX as a coating, crack and gouge filler for the black panels that protect Discovery'swing leading edges and nose cap. Made of a carbon composite called reinforcedcarbon carbon (RCC), the panels endure the hottest temperatures when theshuttle reenters the Earth's atmosphere. "It's easyto work with," Sellers said after applying the material into several samples ofintentionally damaged samples. "It's just like anything we used in theexperiments." Today'stests were the second orbital evaluations of NOAX. The material was first usedduring Discovery's last flight in July2005, when STS-114 spacewalkers spent onehour performing shuttle tile and RCC repair techniques. Applyingthe NOAX material was easy at first for the astronauts as they used spatulas tosmooth the material. But applying some later coats as a finishing touch was abit tough, they later said. "This isquite hard work," Sellers said as he applied a finishing coat over an earlierrepair. I'm getting warm just mashing this stuff in." Discovery'sSTS-121 pilot Mark Kelly orchestrated today's spacewalk from inside theorbiter, while crewmates Stephanie Wilson and Lisa Nowak worked the spacestation's robotic arm. The spacewalk, the third and last of the STS-121mission, was addedto the spaceflight - along with a 13thflight day - once flight controllers found the shuttle's power supply couldsupport it, NASA said. Developingthe ability to repair at least some orbiter heat shield damage has been acritical concern for NASA since the Columbia accident. In 2003, a 1.67-pound(0.7-kilogram) chunk of shuttle fuel tank foam insulation pierced the RCCshielding along Columbia's left wing leading edge during launch, a criticalwound to the spacecraft, leading to the loss of the orbiter and itsseven-astronaut crew during reentry. Aninvestigation board later recommendedthat NASA develop reliable shuttle heat shield repair methods. NASA hassince redesigned shuttle fuel tanks to reduce the amount of foam they can shedduring launch. The largest area shed during Discovery's STS-121 ascent weighedabout 0.055 pounds - or less than an ounce, and about one-fourth the largestallowable - came off in six small pieces from a total area of 12.3 inches by14.2 inches (31 by 36 centimeters), mission managers have said. "Our numberone goal is to never have to use this," Tony Ceccacci, NASA's lead shuttleflight director for Discovery's STS-121 mission, said of the repair method Tuesday. Sellers andFossum also tested a new infrared video camera during today's spacewalk. Thespacewalkers used the camera to record two, 20-second videos of Discovery'swing leading edges. They then used the camera to study two of the intentionallydamaged RCC samples in the shuttle's payload bay, as well as two others thathad undergone a test repair. "Their hopeis that this is another sensor that we can use to detect damage," Ceccacci saidof the new camera. Ceccaccisaid the camera could be used by hand or be mounted to the tip of Discovery's50-foot (15-meter) orbital boom if its images prove useful for heat shield inspections. 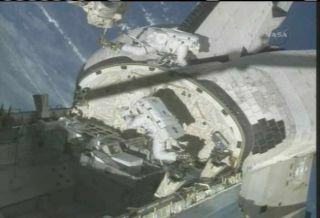 Sellersalso used the camera to observe parts of the ISS, including its radiators andone spacewalkers - Fossum - as he crawled across the station's hull. "It lookslike a glowing person moving over a mirror," Sellers said. Wednesday'sspacewalk was not without incident. At one point, one of the five spatulasSellers carried out with him drifted away after it separated from its appointedtether. "No sign ofthe spatula, guys, it is gone, gone, gone," Sellers said after an initialsearch around his Discovery payload bay worksite. Flightcontrollers later caught the spatula on video cameras as it floated out ofDiscovery's bay and into open space. It is not expected to pose a debris hazardto Discovery or the ISS, NASA officials said. "That wasmy favorite spatch...don't tell the other spatulas," Sellers said, then latertook heart when Kelly told him it was not a debris risk. "Thanks for doing allthe work on this, I'm sorry to let it go." Unlike Monday'sspacewalk, in which the latches connecting Sellers' emergency jetpack -known as the SimplifiedAid for EVA Rescue (SAFER) - to his spacesuit popped open and had to be tetheredin place, the astronaut left the airlock prepared Wednesday. Hiscrewmates covered the two SAFER latches with Kapton tape to prevent the latchesfrom shaking loose. Even so, Fossum had to help Sellers a few times to preventthe tape from coming free and to secure the SAFER door, NASA officials said. Wednesday'sspacewalk marked the third extravehicular activity (EVA) of Fossum'sspaceflight career and the sixth for Sellers. It was the 21st spacewalkstaged from the station's Quest airlock.